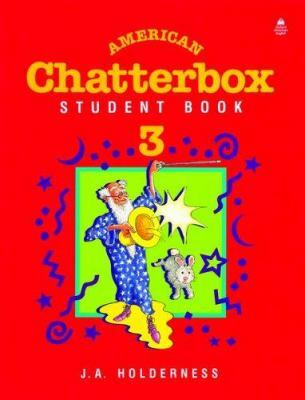 American Chatterbox SCOPE and SEQUENCE CHART Level 1 Unit 1 Language items Hello. Goodbye. What's your name? I'm . My name's Woody. Who's this? This is . Possessives: my/your The alphabet. Functions and topics Greeting and saying goodbye. Asking someone's name. Introducing yourself. Introducing others. Talking about possession. Unit 2 Language items Listen, please. What's this? Article: a + noun. Good morning. How are you? I'm fine, thank you. Functions and topics Commands. Identifying things. Further greetings and responses. Unit 3 Language items Numbers 1-10. How old are you? I'm ten. We're twins. This is 943-1286. Article: an + a e i o u Functions and topics Counting. Talking about age. Telephone numbers. Unit 4 Language items It's a kite. Functions and topics Naming common toys and household objects. Unit 5 Language items He's seven. She's eight. Possessives: his/her Review. Functions and topics Talking about possession. Unit 6 Language items Is it an airplane? Yes, it is. / No, it isn't. Article: the + noun. Adjectives: the big/small box. Functions and topics Asking for information. Specifying particular objects. Unit 7 Language items I have a big nose. This is my mother. She has big eyes. We have a letter. Functions and topics Describing people: faces and hair. Members of the family. Unit 8 Language items Do you have your bag? Yes I do. / No I don't. Does she have her umbrella? Yes, she does. / No, she doesn't. Adjectives: tall, short, etc. Functions and topics Asking for information. Describing people. Unit 9 Language items Can you see an elephant? Yes, I can. / No, I can't. Whose cage is this? Possessive 's: the lion's cage. Turn right, turn left. Functions and topics Talking about ability. Talking about possession. Zoo animals. Giving directions. Unit 10 Language items Show me the green kite. What color is her skirt? It's red. Review. Functions and topics Colors. Clothes. Unit 11 Language items He has brown legs. He's from the United States. Functions and topics Parts of the body. Saying where people or things come from. Unit 12 Language items Plural nouns: -s/ -es. There's . / There are . Is there . ? Yes, there is. / No, there isn't. Prepositions: in, on. Functions and topics Describing situations. Asking for information. Specifying location. Unit 13 Language items How many monsters are there? How many . can you see? Preposition: at + the bank, etc. Functions and topics Asking about number. Stores and places in town. Unit 14 Language items What time is it? It's twelve o'clock. At eleven o' clock . in the morning/evening. Functions and topics Asking and telling the time. Specifying the time of day. Unit 15 Language items Square, circle, triangle. Review. Functions and topics Talking about shape.